Last July, �ber market-timer Martin Armstrong predicted a gold bottom could happen between November 30th and December 7th or, during a certain week in early 2016 (known to his subscribers); and because I believe silver is subject to the same market forces as is gold, i.e. manipulation by the paper money cabal vs. free market supply and demand, a silver bottom would be in as well. Because of Armstrong�s reputation for accurately calling market turns (he predicted the 1987 stock market crash, the 1989 top of the Japanese Nikkei, etc. ), I am always interested in Armstrong�s predictions; and, as December approached, on November 24th, an article in MarketWatch, The case for why gold may finally be nearing a bottom supported Armstrong�s prediction of gold nearing a bottom. Then, between November 30th and December 7th as Armstrong had predicted, Rick Ackerman of Rick�s Picks wrote that a gold bottom could be in. On December 3rd, in his article, Gold Inches from a Major Support, Ackerman noted that gold�then at $1,049.80�was inches from a possible bottom. I hold Rick Ackerman (Rick�s Picks) analytical skills in extremely high regard. Because of Ackerman, I had profitably exited a previously-losing position in Agnico-Eagle warrants at the top of gold�s extraordinary 35% 2-month surge in 2006. In my article Timing The Gold Bull, I wrote of my experience with Ackerman and his �hidden pivots� strategy. Using a technical model Ackerman based on �hidden-pivots�, Ackerman predicts tops and bottoms, i.e. turning points, for all markets, i.e. commodities, treasuries, stocks, etc; and, in 2006 we had an opportunity to see what Ackerman�s hidden-pivots could do. In 2006, we were holding warrants issued by Agnico-Eagle Mines. Warrants on gold mining shares can often be more volatile than profitable. In March 2006, our warrants had lost 2/3 of their value before gold suddenly began moving upwards, increasing exponentially the value of our warrants in a very short period of time. Warrants, by definition, are time-dependent giving buyers the option for a limited time to purchase underlying shares at a predetermined price; and as gold began rising in 2006, the question became, what would be gold�s top before it turned down? Gold had started its rise in mid-March at $535. In April, it moved up past $600 and by the end of the month was nearing $700. The hidden-pivot Ackerman predicted for gold�s turning point [i.e. top] was $715.50 and I remember watching gold�s daily move towards Ackerman�s hidden-pivot. Note: The next day, on May 12th we sold the now highly-profitable warrants and enrolled in Rick Ackerman�s Hidden Pivot Seminar in New York to find out how he had made his astonishingly accurate prediction. Indications pointing to a gold bottom were also noted on December 3rd, in the Gold Basis Service, a subscription newsletter by Sandeep Jaitly at Fekete Research; and, as with Martin Armstrong and Rick Ackerman, I am always interested in what Jaitly has to say. �the gold basis is the difference between the futures price and spot price of gold. However, there is a refinement to this observation after Carl Menger. Menger was the first to realise that economic analysis should have its foundation in terms of �spread� as opposed to �price�. The price of a good itself does not exist as a monolithic entity but is composed of a spread itself: the bid-offer spread. The idea of a spread has been transferred to the concept of carry, in particular with regards to gold. There is no such a thing as the carry for gold: the carry itself is composed of a spread the lower bound of which is referred to as the �co-basis� and the upper bound the �basis�. Simplistically, the co-basis and basis are analogies in the space of carry to the bid and offer in the space of prices. The shorter-term movements in the bases are indicating that there�s likely to be real supply coming to the market that may depress gold/silver prices in the shorter term. Today saw an intra-day reversal of gold with spot having reached a high of $1,183.10. There�s a risk that gold may test the intermediate lows in September. Should there be a reversal in the current trend in the bases, notification will be sent. The fiat v. gold/silver exchange rose as was mentioned might occur. However, with that the basis/co-basis has moved sharply lower/higher. December has given way to February gold in terms of largest open interest. April gold is already in backwardation and still only represents less than 10% of total open interest! April gold being in backwardation at this early stage has no precedent. To all intents, gold and silver have reached permanent backwardation � in that the active contract (as well as the next and one after) is in a consistent state of positive co-basis. The next stage of fiat�s demise will involve a rising and positive co-basis. This ties in with a low and falling fiat interest rate and the theory relating the two is being developed currently by the New Austrian School team. One will have to be up to scratch with all aspects of Mengerian economics from marginal utility to marketability and bills of exchange to keep pace; you have been warned!.. CONCLUSION: �The extent (not level) of backwardation and relative open interest reached has no precedent. The dips that have occurred in the metals have presented the opportunity to accumulate. Whether around here is the ultimate low [i.e. bottom] will have to be seen but there is a high probability that it�s in place. (1) A bottom in gold and silver prices may now be in place�and, if not now, then, as per Martin Armstrong, during a week in spring 2016 (known to Armstrong�s subscribers) and (2) Martin Armstrong�s model of predicting economic turning points deserves very serious attention. 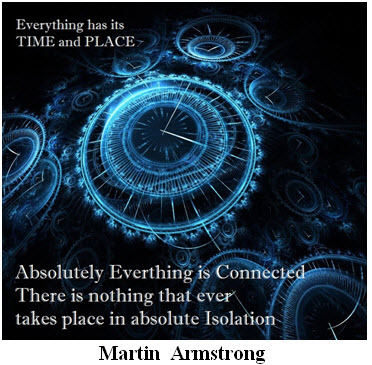 The September 1999 fall of Martin Armstrong is like the fall of gold in September 2011. Both were pushed. In the 1990s, Martin Armstrong�s economic predictions began attracting serious attention. After calling the top of the Japanese Nikkei (December 31, 1989), Armstrong was referred to as �Mr. Yen� by the Japanese press and political luminaries such as Margaret Thatcher and Henry Kissinger were among those attending Armstrong�s annual conferences held at the Imperial Hotel in Tokyo. The political interest in Martin Armstrong and his predictions, however, would lead to his undoing. An article in The New Yorker Magazine noted the CIA�s interest in Armstrong�s Economic Confidence Mode which correlated economic and political events with shifts in economic confidence. The New Yorker article on Armstrong, The Secret Cycle, refers to Armstrong�s 8.6 year cycles, the basis of his Economic Confidence Model. 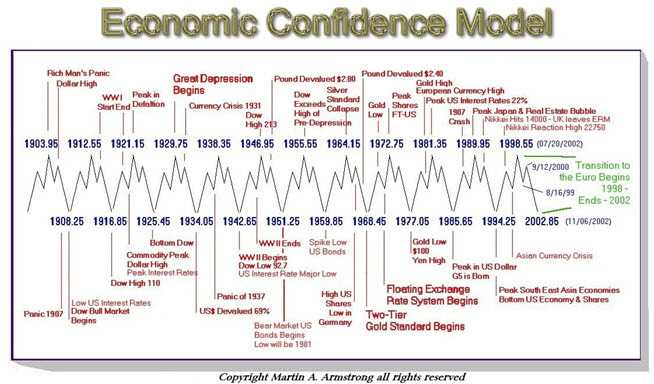 An avid student of history, Armstrong constructed a computer model, a timeline of significant historical events, based on 8.6 year cycles which allowed him to predict the 1987 US stock market collapse, the top of the Japanese Nikkei and the collapse of the Russian ruble, etc. The CIA wanted his model. ..[In 1999] the C.I.A. telephoned his firm [Princeton Economics], eager to get a closer look at his model. Agents had been watching him and were curious about how he had managed to call the collapse of the ruble. They asked if he would come to Washington..and build his model for them. Armstrong refused. Armstrong told his mother, They want it for all the wrong reasons (his mother had clearly taught Armstrong the difference between right and wrong). Turning down the CIA, however, would trigger a 12-year nightmare for Armstrong. In September 1999, the US Attorney accused Armstrong of defrauding Japanese investors of almost a billion dollars and ordered him to turn over enumerated assets and documents to the court�including computers with the source code for his Economic Confidence Model. After the computers were turned over, a computer forensics expert said that 591 computer files had been deleted with X�s written over them; and, on January 14, 2000, the US magistrate, Richard Owen, ordered Armstrong jailed for contempt of court. NOTE: Despite the statute limiting such contempt to 18 months, Armstrong was imprisoned without lawyers, trial or charges for over 7 years, the longest Federal civil contempt of court imprisonment in American history. The adjudication of Armstrong�s case was to be even more bizarre. Two months after he was charged with stealing hundreds of millions of dollars from Japanese investors, the investors sued�not Martin Armstrong�but Republic National Bank and two of its executives for securities fraud. In January 2002, Republic Bank (now owned by HSBC) agreed to repay Armstrong�s investors $606 million in return for immunity for the two bank executives and obtained a lifetime gag order preventing Armstrong from releasing information about the bank�s actions. 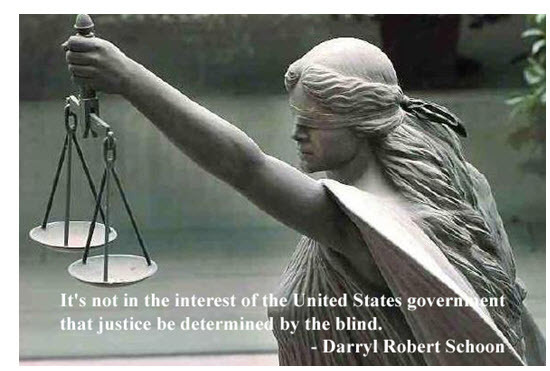 Law and order � whose laws, whose order? Although Armstrong�s investors received full restitution from Republic Bank, Armstrong remained jailed without bond or right-to-trial until 2006 when now-Supreme Court Justice Maria Sotomayer �in the interests of justice� removed US Magistrate Richard Owen from Armstrong�s case, ending Armstrong�s seven-year imprisonment for contempt of court. In 2006, Armstrong pleaded guilty to one count of conspiracy, i.e. of commingling investor funds although contractually allowed to do so by the bank; and five years later, in 2011, twelve years after refusing to give his Economic Confidence Model to the CIA, Martin Armstrong was released from prison. NOTE: Martin Armstrong�s release on September 2, 2011 coincided with gold�s high of $1920. On September 3rd, the paper money cabal using negative gold lease rates flooded upward surging gold markets with physical gold triggering a 44-month decline that ended between November 30th and December 7th 2015�as predicted by Martin Armstrong. The events surrounding Martin Armstrong involve the manipulation of the metal markets (especially silver), the death of banker Edmund Safra, the rise of Vladimir Putin and 9/11. Whilst I have read a lot on this site about Armstrong and his supposed short gold position, etc., etc., etc., I just thought everyone should know that it is all BS. I have worked inside Republic Bank and quite frankly the whole thing stinks of a major set up intended to frame Armstrong big time. Armstrong was right about the manipulation of silver and a whole lot more. Not only was silver manipulated, they do it all the time. If you want to know the truth, it was Republic who has been behind almost every manipulation I know of for at least the last 10 years, I've seen it first hand. Buffet is not lily white and this silver purchase of his was not the first. The manipulation by Phibro in 1995 when they exercised the call options way out of the money was executed by Andy Heck who now works for Republic. The CFTC went to Phibro demanding to know who the client was behind the trade and they refused to give up the name. The CFTC did not do their job, as usual, and just walked away demanding that they exit the trade. Phibro was owned by Salomon Bros and the authorization to squeeze silver was given personally by Buffet. Does anyone really think that a small sub like Phibro could do a $1 billion trade without board approval from above? It doesn't end there. Bribes were paid to Russian officials to "recall" platinum so it could be inventoried. Republic helped Tiger corner the market in palladium and stored it for them just like they moved the silver from NY to London for Buffet. This thing even goes back to the manipulation of the US Treasury Auctions. The govt boys are so stupid, when they threatened to take the license away from Salomon Bros, Buffet came to the rescue. Ha! He was behind that trade as well and his name was concealed then, as always. Then that trader left and started LTCM [Long Term Capital Management] and had a real merry old time. Look at who his investors were! Just before it blew up, Buffet agreed to bailout that operation and wrote a letter stating that if his offer were ever revealed, it would be void. That letter was published in the WSJ because it blew up before Buffet could put the deal to bed. The point is, Armstrong was trying to fight the crowd. He knew what was going on and the word inside the bank was that he might even have tapes of conversations between a lot of the players. Everyone is really worried about that for sure. These guys take the market up get all you suckers believing the rally is real and then slam it again. How do you think they make their billions? They don't care about bull markets. They shag the markets to make their billions off of the people who don't have a clue. They rotate between the markets. All the same names were on the short-side in copper. Sumitomo tried to fight these guys. They baited the Japanese into the trades offering them untold credit. They then would short copper against them. Sumitomo tried to defend their position and ended up buying the entire inventory. When they had Sumitomo loaded, they ran to the authorities and did them in calling it a manipulation. They made a fortune on that short trade. To add insult to injury, Sumitomo ran to Goldman Sachs for help, Goldman started selling thousands of contracts in copper that day and then accepted the work out the following day after front-running their own client. Jimmy Goldsmith was involved in this one as well as Safra, Tiger and a host of others. They amazingly are all on the right side of every one of these trades. Hell - bribes were even paid to bank officials at the Central Bank of Thailand to start the Asian Crisis! That was the evidence the Japanese took to the G7 meeting and demanded controls against the organized hedge funds. The US govt refused to do anything against the group of players because this thing is so dirty nobody wants the truth out there. They told the Japs they would agree to sanctions only. That's why Armstrong is being served up as the Xmas turkey. Quite frankly, he knows too much. Safra was paying bribes to people inside the IMF as well. They all thought they had the IMF in their pocket. That's why they all invested so much into Russia. They even set up Bank of New York on behalf of a rival group of thugs in Russia and because Republic hates Bank of New York because they are not part of the club. These markets are never going to breakout until someone breaks up this organized mob of billionaires. The govt is either too stupid or they are involved with them -- a high probability! After all, Armstrong had a $1 billion credit line in the bank and everyone knew it. Suddenly, his credit line was pulled and Republic took $500 million of his clients money pretending it was never there. That order came from good old Mr. Safra himself and was carried out by George Wendler personally. And if anyone believes that story about Safra's death, I guess they believe in Santa Claus and a few other sudden deaths when the heat got turned up. If Armstrong or his clients got Safra on the stand, the whole thing could have unraveled. His bodyguard was changed just after this affair started. You fill in the blanks. Armstrong was never short 700 tons of gold. In fact, to get the silver manipulation going, Armstrong was out of the country and they ran their orders through Republic to make everyone think it was Armstrong covering short positions he never had. The records are all there! All this stuff is on tapes, docs and emails. The question is, will the govt go along with the big boys and cover everything up again? If so, they say already Armstrong won't make it to trial. They cannot afford a open trial with everything Armstrong knows. He probably knows far more than what has been written here. They just can't afford for the world to know how rigged this game truly is and how these billionaires really make their money at the expense of everyone else. Republic National Bank, the Bank of New York, the IMF, et. al. had roles in the death of Edmond Safra, the billionaire Jewish owner of Republic National Bank. On December 3, 1999, Safra was murdered in his fortress-like penthouse in Monaco by his nurse, a former Green Beret, his coterie of 20 Mossad-trained bodyguards inexplicably absent. Safra was murdered for giving evidence to both the FBI and Swiss prosecutors concerning the diversion of the IMF credit� from the New York Federal Reserve Bank to [Safra�s] Republic National Bank and then to various banks in Switzerland and elsewhere, but not to Russia...at the start of autumn 1999 Boris Berezovsky visited Safra at his estate in southern France. The two men..had a three-hour conversation in "raised voices," after which Safra fled in a panic to his heavily fortified Monte Carlo residence [where two months later he was murdered]. The Bank of New York first came to my attention after meeting Norman Bernard Thirion in Federal prison in 1986. Thirion, Howard Hughes� former banker, told me he had been framed by the Reagan White House after a heated argument with General Robert E. Cushman. According to Thirion, General Cushman�former Commandant of the US Marine Corp and former Deputy Director of the CIA�was chairman of Transglobal Productions, Ltd, ostensibly a New York movie production company, but, in fact, a CIA front created to embezzle and launder $500 million Thirion solicited from the Saudi royal family to aid the Afghan resistance. Thirion and Cushman�s argument involved Transglobal�s purchase�through board member Rabbi Morton Rosenthal�of Russian-made Syrian arms captured by the Israelis during the Six-Day War to be sold at a profit to the Afghan resistance. Thirion argued that the Saudis would be enraged if they discovered their $500 million contribution to the Afghan resistance had profited Israel. Believing he [Thirion] could no longer be trusted, Cushman with the help of the Reagan White House had Thirion arrested on trumped up charges of accepting loan fees; and Thirion, like another American political prisoner, Martin Armstrong, ended up incarcerated in America�s rapidly-growing gulag. Cushman�s covert CIA/ Reagan White House operation was unmasked when the $500 million was discovered co-mingled with money from the Iran-Contra affair (another illegal Reagan operation) in a secret CIA bank account in Switzerland. The secret Swiss CIA bank account was controlled by Bruce Rappaport, a shadowy Jewish Swiss banker. Rappaport, owner of InterMartime Bank Geneva, also owned the Bank of New York�the bank at the center of the multi-billion dollar IMF/Russian money laundering scandal; the same bank which also laundered over $240 billion of securities through the New York Federal Reserve when reporting requirements had been suspended by the SEC in the week following 9/11. 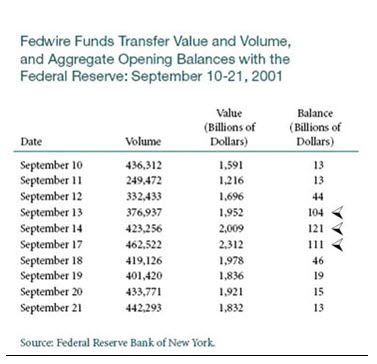 � the Federal Reserve imbalances reported on three consecutive days in the aftermath [of 9/11] were largely concentrated at the Bank of New York�The Federal Reserve, without providing the detail required to substantiate it�s claims would have the public believe that there were widespread liquidity issues, when in fact, the issues were very concentrated; primarily, if not singularly in the Bank of New York. That such disparate events, i.e. the death of Edmund Safra, the rise of Vladimir Putin, the manipulation of metal markets and 9/11 are connected to the case of Martin Armstrong is, in itself, evidence of Armstrong�s belief that EVERYTHING is connected�an interconnectedness which is at the foundation of Armstrong�s Economic Confidence Model and his ability to predict what we call the future. The implication of just the correct forecasts like this on gold go far beyond merely gold. What this demonstrates is that everything is truly connected. That means, if our computer models are correct, then a politician cannot actually run for office proclaiming vote for them and they will change everything. We are all just pieces of an interconnected world. That is the real implications of this forecast in gold. The sooner we realize that what Socrates has accomplished is the revelation that absolutely everything is connected. There is nothing that ever takes place in absolute isolation�These forecasts are NOT my personal OPINION. They are not even my invention. They are the product of my DISCOVERY of time. One day, in a newspaper, he came across a list of financial panics that occurred between 1683 and 1907. On a lark, he divided the span (two hundred and twenty-four years) by the number of panics (twenty-six) and found that, on average, there had been a panic every 8.6 years. As he read more, he began to suspect that 8.6 was a highly significant number. He discerned a recurrence of major turning points in the economy and in world affairs that followed a distinct and unwavering 8.6-year rhythm. Six cycles of 8.6 years added up to a long-wave cycle of 51.6 years, which separated such phenomena as Black Friday and the commodity panic of 1920, and the Second and Third Punic Wars. Armstrong�s �hidden order�, the idea that everything in the universe is interconnected is reflected in Buckminster Fuller�s Critical Path in which Fuller wrote in 1981: �mankind would soon be entering a period of unprecedented crisis, a crisis universally-intended to bring about the transformation of humanity. The crisis that Fuller predicted is now underway. In 1981, Fuller predicted the collapse of the world�s power structures. In 1991, communism collapsed and, today, capitalism is failing as debt, credit�s fatal effluvia, has rendered today�s capital markets impotent in their frantic attempts to revive growth. That today�s institutions�political, educational, religious, and economic�are increasingly unable to solve today�s problems is a sign that that a new paradigm is being born and the passing of the old cannot be prevented. GOLD - IS THE BOTTOM IN? Martin Armstrong told his subscribers gold would make a bottom between November 30 and December 7th or during a certain week in early 2016 (a date known to his subscribers). Today, February 10, 2016, gold closed at $1208, almost $160 above its low of $1050 in the first week of December. Since the middle of January, the co-bases for both April gold and March silver have declined noticeably from the peaks achieved. 15th January saw the peak in April gold�s backwardation with a co-basis reading of +0.06%. As of today [February 4th], this stands at -00.23%. Furthermore similar movements are being mimicked with March silver. This is the first time that both gold and silver have been out of backwardation for over 18 months. Accordingly, in the short term, this is a bearish sign. Gold and silver could possibly fall again and make a new bottom as Martin Armstrong predicted. Nonetheless, the bottom for both gold and silver is either in or soon will be. The battle against the bankers� fiat paper money charade continues with the end now in sight and victory certain. My interview with Ralph T. Foster, author of �Fiat Paper Money� can be seen at https://youtu.be/3InWieQ2NcQ; and, the 3rd episode of Moving Through the Maelstrom: 2016 � The Crisis Accelerates, at https://youtu.be/JpCwBrYjiL0, I explain how I came to predict today�s crisis, our role in that crisis and what we can do. The crisis is now accelerating. It has been a long time coming. Its effects will be unprecedented.